As a busy housewife who loves eating healthily and is truly passionate in cooking, soup and smoothies are always a must for my family dinner every night. A good blender is one of the most essential staples in my kitchen. Is there a blender for every budget or personal preference out there? Absolutely yes. Today, the leading name in my suggestion list for the best blenders will be Vitamix which is now listed 3 on the top 51 blender brands at this website . Honestly, it took me a long while to reach this conclusion and to find the best Vitamix blenders. Let me tell you why! Seriously, there are so many options and all blenders are designed to perform the same tasks: crushing ice into a drinkable slush, cutting through frozen fruits, and pulverizing even the hardest produce into a smooth liquid. At first sight, except for the appearance, their functionalities and capacities may appear to be similar. If you are not an expert on blending technology, it’s too complicated to distinguish all the differences between each unit. As a results, we just randomly pick out the one that we most like the look of, or one that comes from our trusted manufacturers. It was not until I had done a great deal of research into different brands and different models that things became so much easier. At this time, I found that the Vitamix brand was able to exceed my expectations. It is, undoubtedly, the best brand I have chosen to date. As I mentioned above, however, as there are numerous models available, what you probably want to know is how to figure out which one to buy. If you’re feeling confused, just like I was, stop here. . Step by step, I will help you finding the best Vitamix models for various price ranges so that you can narrow down your options when hunting for a companion in your cooking adventures. In case you’re interested in another brands, do not hesitate to have a look and get yourself some useful information at our review on the top blenders of this year. Why Should We Choose Vitamix? Before jumping in and buying one, many will ask: “Do I really need a Vitamix blender to make smoothies at home?” With the goal of helping you get the answers you need, today I’ll put my responses here for everyone’s interest. If you live and active, busy life and plan on improving your daily meal with more greens or you would like to be adventurous in the kitchen, then the best Vitamix blender is a worthwhile investment. Surely, it will be a worthy purchase for experimenting more healthy options. Can it make steaming-hot soup? No problem. Can it blend frozen fruits? Sure thing. Can we use it to crush ice cubes? In a matter of seconds. In general, when thinking about a blender, most users might think of just smoothies, but this device proves to be a great tool for a variety of purposes. The machine itself does a great job of pureeing tough, hard foods, such as carrots, spinach, peanuts and others, even when they’re frozen. It can also be used to puree the tough ends of asparagus for delicious soups. It’s built like a tank and works like a beast, blending anything you throw at it with ease. It Offers A Combination Of Durability, Efficiency And Long Service Life. Not only that, they appear well-made, feel strong and are impressively convenient, quickly and effectively creating endless culinary creations. Let me be frank here: the blender-cleaning process is nothing complicated. Thanks to its simple design, cleaning is a breeze. No fuss, no mess, no hassle. Simply pour hot water into the container, add a bit of soap, turn the blender on to the highest setting and let it run for 10 seconds. After dumping out the solution and rinsing the pitcher thoroughly, your blender will be ready for a new batch of smoothies. Or if you don’t have much time, just put it in the dishwasher after each use. It really is as simple as that! What is the best Vitamix blender? Here we look at some of the most important characteristics you should focus on, so as to identify the best Vitamix blender for your needs. We all know that the motor power is one crucial factor when it comes to kitchen appliance. Not to mention, the higher the wattage, the better the machine performs and of course the more you will spend. Run on 2.0 or 2.2 horsepower motors, yet 40% quieter compared to other brands, all the Vitamix models are high performance blenders which can be used to make more than just smoothies or soups. Blades made of stainless steel are a must. They should also be super sharp. Apart from ensuring your own safety, they make it easier and faster to grind hard foods such as bones, meat, beans, and more. This factor is essential and highly affects the texture/consistency of food. I would recommend you pick out a model with variable speed control. One of the main advantages of this is that it offers a wider variety of what can be made. Not only is a good blender required to bring about satisfactory results, but it must be easy to clean as well. This means you should find something that is built on a self-cleaning standard. Sometimes, new products don’t the job for which they’re being advertised, so my advice is to select a machine with a warranty covering defects for at least one year after purchase or delivery. As one of the rarest manufacturers that delivers the best customer service in the industry, the good news is that all new Vitamix blenders come with at least 7 years full warranty, ensuring many years of service. If the Vitamix blender sounds like a good fit for you and your healthy lifestyle, do not hesitate to take a look at the list consisting some of the best models below to pick out the one that best suit your requirements. As far as blenders are concerned, Vitamix is always the first name that comes to my mind. This brand has been popular not only for its high-quality products but also for its reliability in the market. The model in this deal has proven that you can’t go wrong if you choose Vitamix. As for performance, this machine has an incredibly powerful motor as well as a variable speed rheostat, providing users much more control. Its very large capacity 8+ cup mixing vessel is made of a strong plastic which makes this blender much lighter than expected. Additionally, the blade assembly is sharp and sturdy. It’s designed so incredibly well that it’ll blend everything flawlessly. Apart from being capable of making cream sauces out of nuts, this machine is also ideal for making soup- something that lots of other models out there cannot do well. With the Vitamix, nothing is impossible. Moreover, it’s not as loud as I thought it would be, which is a very pleasant surprise. Is it easy to use? Absolutely. However, there are some complaints that until now the manufacturers still cannot resolve the necessity of having to use the tamper while operating. Particularly, so as to get texture consistency, you have to force the content really hard to get everything down into the blades by using the tamper. This means you cannot set the machine and let it run by itself. Almost everything you make with this blender does require manual effort. Another issue is that it’s rather tall, and doesn’t fit on the counter under an upper cabinet like a standard mixer, but that’s a minor complaint. The machine is also a little bit on the expensive side. But imagine – if you’re a fan of smoothies, it may be much more costly to buy several cups a week at the local smoothie shop. So, my point is: although you may have to make a sizeable initial outlay for a small kitchen appliance, what you get from it is a lot of power and durability with a wide variety functions. Considering the aforementioned savings on a smoothie shop, it pays for itself over time! The first thing you need to know before digging a little deeper into this model is that you can buy it new or refurbished. This affordable option is readily available for the 5300, which makes it more appealing to many customers, especially for those who are on a budget. 10 adjusted variable speeds: Together with the pulse button, the variable speed control plays an important role in maximizing the using flexibility, allowing users to achieve a variety of texture they need. 2.2 HP motor (1640 wattages): Equipped with a high-powered motor, the blender itself can process even the toughest of ingredients. It is so powerful that the foods will actually start to heat up after long blending time due to the friction caused by the blades. As a result, steaming-hot soup can be cooked right in the container without being heated up by a stove. High-quality stainless steel blades: they are all sharp enough to help you in grinding nuts or coffee, mixing batters and dough and creating chilled desserts in seconds without having any problem with dulling over time. While the Vitamix 5300 is a good choice, there are many other blenders you can choose. So, how do you know this good choice is the RIGHT choice? In comparison with the 5200 model, this gadget has a more powerful 2.2 HP motor while taking up less space and easily fitting under most kitchen cabinets thanks to the newer 64-oz low profile wet container. Plus, by reducing the number of controls to three: the on/off switch, the pulse, and the speed control, the blender has become much simpler to operate. It makes less noise, too. All things considered, if you are looking to upgrade to a monster blender, the Vitamix 5300 is definitely a wise investment. It is very durable and will stay with you for a long time. Now it’s time to talk about the Professional Series 750, which is another well-rounded product of Vitamix’s varied kitchen blender collection. First and foremost, this functional and aesthetically pleasing device is the most powerful yet quietest model the Vitamix has ever created. It does everything that the 5300 version does but with better results, taking a giant step towards becoming an important part of any meal preparation. The other differences between these two models would be the higher price point of the 750 and the pre-programmed settings that it offers, which effectively keeps you in control of your blending. Developed with 5 different presets for specific needs, consisting of smoothie, frozen dessert, soup, puree recipes and a setting for automatic cleaning, I am confident that the machine is presently in the position of satisfying even the strictest demands of its customers. It also comes with a manual speed dial for those wanting to manually control the speed. The sum total of the items included in the box are the motor base, a 64 oz tritan BPA container with lid and an updated blade seal, an introductory DVD, a high performance blending recipe book and the low-profile tamper. All of them seem super high quality and sturdy as well as extremely useful. For safety reasons, there is no glass option for the container. That being said, in agreement with many buyers, this blender is only excellent if exclusively used to make very large batches of product. If you are planning on buying it for personal use, there are the 32 oz wet/dry containers and the mini tamper as the accessories for you to consider. Another model from the Vitamix family: the Vitamix Standard Programs Blender (also known as the Vitamix 6300). Reasonable pricing, usability, technology and aesthetics all coming together in one piece of work. We expect this brilliant design to surpass all your expectations for years to come. Being a member of the C-series product line, this machine lives up to its name in functionality while also satisfying its user with a sleek appearance and unique handle design – a design that can easily go with a variety of kitchen decor. In term of performance, it’s quick, quiet, and blends foods exceptionally well. It’s everything it’s advertised to be, except for when it comes to pulverizing nuts. Don’t get me wrong; it does a good job of turning nuts into excellent-quality milk. However, you may need a nut bag to extract excess fiber from the final results. Technically, it has a set of auto-presets for soup, smoothies, frozen drinks. Even with a few less preset functions than the 750 version, it still allows users to prepare gourmet meals with the speed and precision of a professional chef. For those who feel these options are unnecessary tools and would prefer to experiment with their own recipes, they can run it manually by using the variable 10-speed control, along with a pulse setting to get complete control over every texture. Compared to the S-series, it’s about twice the size and much taller, but don’t worry – this size is still considered to be compact enough to properly fit beneath your upper cabinets or to display on your countertop without taking up too much space. 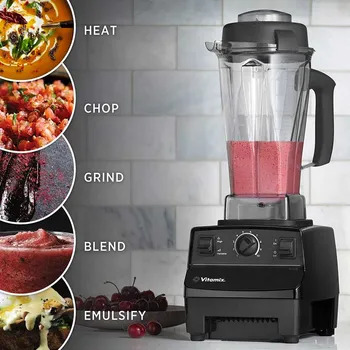 Whether you’re struggling to find your true passion in the culinary art, pursuing better food choices or enjoying restaurant-quality smoothies at home, with the Vitamix 7500 Low-Profile Blender you’re always ready to prepare a great variety of meals with very little effort. Manufactured in Cleveland, Ohio USA, this model is a solid all-rounder blender/food processor that delivers wonderful results. It’s also one of the best blenders on the market right now from making smoothies to frozen margaritas for commercial purposes. Though it costs 3 times as much as the Ninja brand, the reputation of Vitamix quality and the fact that we are finally eating fruits and veggies daily make spending extra money totally worth it. It’s much more than a blender, it’s a prudent investment in one’s health. There’s many reasons why this popularly known model is the most trusted by many professional chefs. First off, it has been specifically designed to be about 40% quieter than other Vitamix models. Truly, I was shocked at how much less noise it made at the first use. It’s actually much quieter than I thought it would be. Secondly, in term of performance, it does a great job of blending all types of berries such as strawberries, raspberries and blackberries. That being said, you need to know it cannot do this task so thoroughly. As these kinds of seeds are simply too small to completely blend or to get their way to the blade, you’re still left with tiny bits in your smoothie cups. That is not such a big surprise, at least with me. Another nice perk is how the device can practically perform self-cleaning. Simply pour warm water with a drop of dish soap into the container, let your machine blend at the highest speed, and then watch it self-clean in just a minute or less. No scrubbing required if you don’t let stuff dry on the sides. However, as the container is not dishwasher-safe, you’re not supposed to put it in the dishwasher for any reason. The Vitamix 750 model is definitely the real deal with excellent performance. Yes, it seems to be overpriced for what you’re getting from the simple design, but if you don’t mind paying for quality then this blender may be the most useful kitchen appliance for producing the best frozen treats you’ve ever tasted.